Do you need a basic online presence for as cheap as possible? We can create a Company Facebook Profile for you at very little cost! The entire marketing of some start-ups are completely built on Facebook! 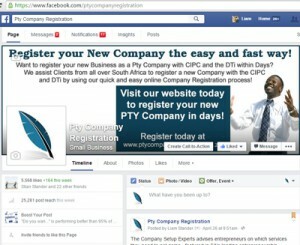 We will register your Company Facebook Profile in the quickest possible timeframe. Facebook connects millions of South Africans every day. There are many people that connect on Facebook that need your products or services. With a Company Facebook Profile you are able to promote your offerings and attract potential customers to your business. We can help. Keeping your Facebook Business Profile active will help to attract people to your Page and build trust around your brand. Clients will be more willing to use your services when you have an active Facebook Page, than your competitor who has no online presence. (2) Your Company Profile is available to clients online, 24 hours a day. You do not have to be in Facebook all the time. You can set up posts or adverts in advance and then schedule when they are displayed on your Facebook Page. (3) Reach a Specific Audience. If you have a product or service that is very specific to a certain type of client, then you can set up adverts that targets only those clients. For example, Women, in the Greater Gauteng Area, who likes Food Magazines. Company Name. You would need a Company Name and preferably a Registered Company with a name. Personal Facebook Account. You need to have a personal Facebook Profile before you can create your Company Facebook Profile. We will review your company’s details and website. Using the information provided, we will setup the Company Facebook Profile for your Company. We will send you the link to the Facebook Profile. After you’ve reviewed it and we have made final changes, you will get complete control over the Profile.